Get your FREE Sample issue of The Armourer today! 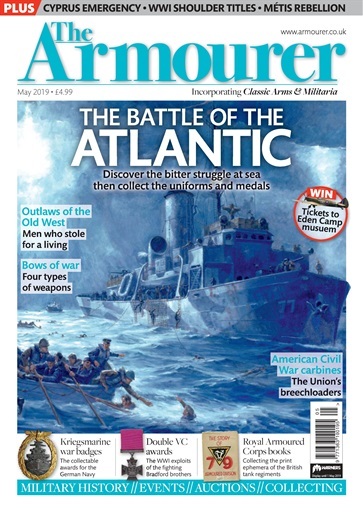 (0 Customer Reviews) | Write Review 12 issues per year The Armourer is the UK's No.1 magazine for militaria collectors and military history enthusiasts with a worldwide readership. Launched at a militaria fair in 1994, the Armourer is a magazine by collectors, for collectors. In every issue, an inexhaustible stream of artefacts linking us to past conflicts throws up interesting stories. Regular articles on ordnance, bayonets, medals, insignia, uniforms, military museums, auctions, World War I and World War II make the Armourer the UK's premier militaria magazine. • The Battle of the Atlantic – Discover the bitter struggle at sea then collect the uniform and medals. • WIN tickets to Eden Camp Museum. • Outlaws of the Old West – Men who stole for a living. • Bows of war – Four types of weapons. • Kriegsmarine war badges – The collectable awards for the German Navy. • Double VC awards – The WWI exploits of the fighting Bradford brothers. • Royal Armoured Corps books – Collecting the print ephemera of the British tank regiments. • American Civil War carbines – The Union's breechloaders. The Armourer is the UK's No.1 magazine for militaria collectors and military history enthusiasts with a worldwide readership. Launched at a militaria fair in 1994, the Armourer is a magazine by collectors, for collectors. In every issue, an inexhaustible stream of artefacts linking us to past conflicts throws up interesting stories. Regular articles on ordnance, bayonets, medals, insignia, uniforms, military museums, auctions, World War I and World War II make the Armourer the UK's premier militaria magazine. 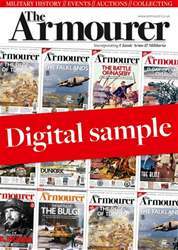 You'll receive 12 issues during a 1 year The Armourer magazine subscription. You'll receive 12 issues during a 1 year The Armourer magazine print subscription.